Pilot life can be exhausting. From long duty days, time zone changes, and busy traveling schedules, it’s no wonder that pilots are so vulnerable to fatigue. Unfortunately, when it comes to the aviation industry, pilots cannot afford to feel fatigued, as their ability to perform their tasks is absolutely critical. In today’s blog, we are going to explore pilot fatigue and share some helpful tips on how you can prevent pilot fatigue for safe flying. Pilot fatigue is a mental state in which a pilot has reduced mental and/or physical performance. What are the symptoms and effects of pilot fatigue? Whether you are flying solo or have a cabin full of passengers, it’s important you are able to recognize the signs of pilot fatigue and have a good understanding of the consequences of pilot fatigue — as they can be quite dire. Now that you know more about pilot fatigue and its causes, symptoms, and effects, it’s easier for you to understand what you can do to prevent pilot fatigue altogether. To make it easy, we are going to discuss a few main steps you can take before a flight to ensure you are at the top of your game. While you may run to the coffee pot for an energy boost, you should actually be filling up your water bottle — as water is a main energy source for the body. When you consume water throughout the day, you feel more awake, alert, and better overall. Staying hydrated cleanses your body of toxins, keeps your body functioning smoothly, and reduces your cravings so you eat healthier and avoid a sugar crash. A little boost of caffeine is not bad, as long as you are not dependent on it due to lack of sleep. If you need some extra caffeine before a flight, consider pure sources of caffeine, such as coffee or tea rather than sugary energy drinks or soda. Also, watch how many cups of coffee you are drinking, as too much caffeine can lead to anxiety, an upset stomach, dehydration, dizziness, and other unwanted symptoms while in flight. We all know that the average adult should get around eight hours of sleep a night. As a pilot with varying schedules who is constantly changing time zones, this may be a struggle to say the least. It’s best if you can get your body into a regular sleep-wake cycle, but at the very least you should ensure that you get the best quality sleep possible. You can do this by avoiding screen time before bed, relaxing your body with tea, putting in earplugs, and wearing a sleeping mask. When you travel across multiple time zones, jet lag is inevitable. However, there are steps you can take to prepare and mitigate jet lag symptoms, and ultimately pilot fatigue. Reduce jet lag by changing your clocks to the destination time zone as soon as possible, staying hydrated, avoiding alcohol and caffeine, spending time in the sunlight, and sleeping at a “normal” time according to the time zone. There is no doubt that a pilot’s lifestyle can make it easy for one to be prone to pilot fatigue. 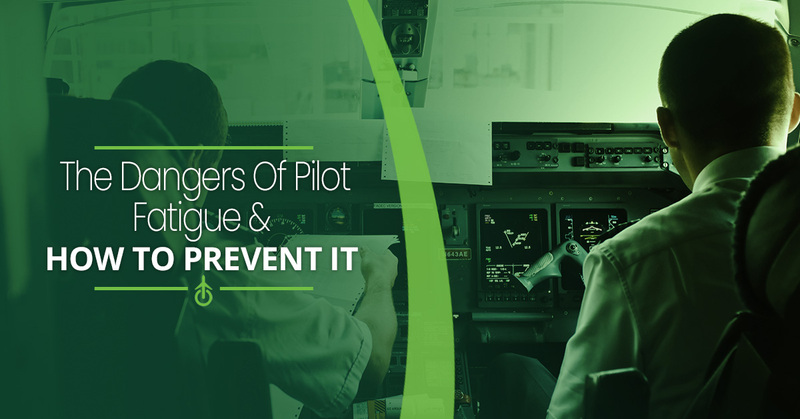 However, we hope that the knowledge gained from this blog and our tips for preventing pilot fatigue help you to make the lifestyle changes needed to feel and perform your best while in flight. For more pilot tips, check out our aviation blog! Or visit www.cpat.com to improve your skills through our online aviation courses. Become a better pilot today!